The Sounders earned their first win in LA since 2009, thanks to a two-goal outing from Jordan Morris, closing in on Portland for the final playoff berth. On a scorching day in Southern California, Jordan Morris was the hottest part of the match between the Seattle Sounders and the Los Angeles Galaxy. Down a goal in the first half in 93-degree heat, the Sounders’ star rookie scored twice in the second half to lead a 4-2 win, their first road victory over LA since 2009. Interim head coach Brian Schmetzer praised his striker after the game, calling his performance “tremendous. In the 63rd minute, Morris grabbed his first goal to break a 1-1 deadlock , He flicked down a long ball forward from Alvaro Fernandez and torched center back Daniel Steres to win a one-on-one with Galaxy keeper Brian Rowe. Rowe charged out of the net, but was beaten as Morris hit a right-footed shot to the upper left corner. Morris said he had to be patient in the heat, suspecting that he would get a window in the second half. The 21-year-old bagged another 10 minutes later, after a saved shot from substitute Nelson Valdez landed in front of him. Morris pulled the ball behind him onto his left foot, finishing into the net as Rowe struggled to recover. Morris said the patience he has developed over his first year helped him keep his composure. The development of the Mercer Island native’s finishing ability has been crucial to Seattle’s attempt to turn around a 6-12-2 record that led to the ouster of head coach Sigi Schmid. Since that mark, Seattle is 5-1-3, and Morris has five goals — he has 12 for the season — and two assists, finishing chances that he would have put wide earlier. As a rookie, Morris is already making history. His game-winner in the 73rd minute was his sixth game-winning goal, extending the record he broke against Vancouver. His 12-goal campaign is the second-best all-time by a rookie, and best by an American rookie, in league history, trailing the 17 goals scored by Canadian Cyle Larin in 2015. Of equal importance has been the play of Nicolas Lodeiro, who assisted on a thunderous goal by Osvaldo Alonso. Lodeiro has a goal or an assist in the past seven games. Seattle (11-13-5) started the same lineup from a 1-0 win over Vancouver Sept. 17, one lacking Clint Dempsey, still recovering from a procedure for his irregular heartbeat. 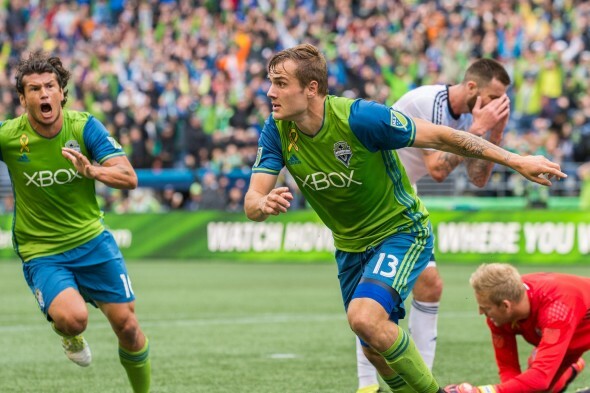 The Sounders were also without captain Brad Evans, benched with a strained left calf. LA (11-5-15) opened the scoring with a header by Robbie Keane in the 20th minute on a chipped ball from Sebastian Lletget. The Sounders benefited from an own-goal by defender Jelle Van Damme after Sounders left winger Andreas Ivanschitz scuffed a corner kick off Van Damme’s head and into his own net. After Morris put Seattle in front, Alonso blew it open. In the 78th minute, a pass from Lodeiro redirected off referee Armando Villareal gave Alonso time and space to rocket a low shot to the right side of the net from beyond the 18. Things became tense after Keane scored his second goal from the penalty spot in with five minutes left. The Sounders held firm, however. Seattle moved within three points of the sixth and final playoff spot, occupied by the Portland Timbers, who lost to Houston Saturday. The Sounders will have a chance to move into a tie on points with Portland Wednesday when they host the Chicago Fire (7:30 p.m., JoeTV). The win over their Western Conference rivals was a major lift. Seattle is closer to a playoff spot than it has been all season. “I can’t put my finger on just one thing (to explain the change),” Schmetzer said. “You’re going to get a bump with a new coach . . . You have the inclusion of Lodeiro, and that’s a big factor, a massive part of our team. The only thing I would add is I think Seattle teams have always been proud teams. The unofficial team record for goals by a rookie for the season is 18 by Mark Peterson back in the NASL days. But Morris seems to be having things click now. Early in the season his goals were near misses but at least he was in position. Now he’s making them. I’m sure Lodeiro’s presence is making things easier for him. These two are slowly becoming what Dempsey and Martins have been the past few seasons. People have been criticizing Morris for not having a left foot. Bagging that second goal with his left foot will help answer that. Very glad to get a win in Carson. Long time coming.